I found the remarks by Matteo Salvini typical of his heavy, Lega humour, about the “detention” of the Mona Lisa in the Paris Louvre quite amusing if ill-informed. The Mona Lisa was, in fact, sold to the King of France by Leonardo or his direct heirs. So Italian demands to have it back as of right are ill-founded, despite any French ‘provocation’ on quite unconnected matters. Salvini could just as well have cited the French attempt to annex the French-speaking Val d’Aosta in 1945 or, going much further back and possibly closer to Salvini’s heart, the destruction of the Lombard kingdom by Charlemagne, as “reasons” for having the Mona Lisa back in Italy by way of ‘reparation’. But there was in fact a Salvini precursor. In 1911, an Italian carpenter working in Paris stole the Mona Lisa from the Louvre and carried it to Italy, offering it for sale to the director of the Uffizi gallery, in Florence. Once he had got over the initial shock, the director contacted the police. The carpenter was arrested and the Mona Lisa was restored to its rightful place in the Louvre, after a triumphant ‘procession’ through then Lega-free, northern Italy. But if Salvini needs an outlet for his ‘nationalistic’ fervour, there is one to hand. He was elected to the Italian Senate from the college of Calabria. 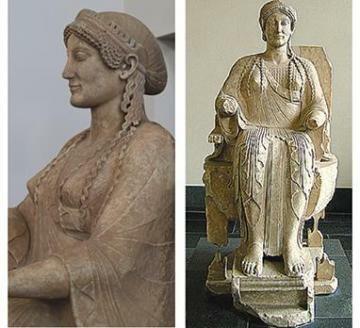 In that area, there is an artistic casus belli of very significant importance: the removal of the marble statue in the archaic style of a sitting Persephone from her temple just outside the walls of the Greek city of Locris Epizephyri, on the southeast coast of Calabria, near modern Locri. It went to Taranto, Paris, Switzerland and, eventually, to the Pergamon Museum in Berlin, which, in 1916, purchased it by public subscription, the old version of ‘crowdfunding’ and in this case the ‘crowd’ included Kaiser Wilhelm II. There Persephone remains, stubbornly labelled as “goddess from Taranto” by the Germans and ignored by her ‘own’ people, who have steadfastly refused even to broach the matter with the Pergamon. Salvini might render a better service to his ‘constituents’ by working to re-establish contact with Persephone rather than spending his time ‘needling’ the suspended mayor of Riace, Domenico Lucano, for his work with immigrants.